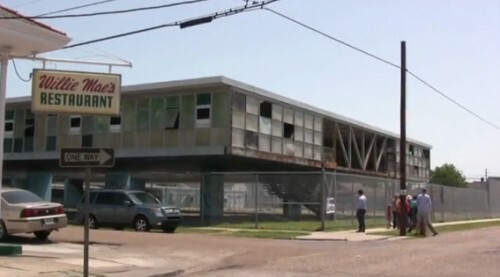 Filmmaker Evan Mather, one of the country’s few architectural filmmakers, makes a viral appeal for Charles R. Colbert’s Phillis Wheatley Elementary School in New Orleans, which is set for demolition this summer. Appropriately titled A Plea for Modernism, the 12 minute short makes the case that buildings like Phillis Wheatley are disappearing throughout the Crescent City (watch the video after the jump). The school–owned by the Recovery School District and located in the historic neighborhood of Tremé–is one 30 schools in the city from the postwar Modernist Movement of the 1950s and 60s (only four of those schools still stand). New Orleans is also home to Moisant Airport, the Greater New Orleans Bridge, and other works by the likes of Goldstein, Parham & Labouisse, Modjeski & Masters, and Curtis & Davis. Mather’s other films include A Necessary Ruin: The Story of Buckminster Fuller’s Union Tank Car Dome, which documents the demolition of another Louisiana Modernist masterpiece.